Dr. John Dee (1527-1608), Queen Elizabeth I’s court advisor and astrologer, was the foremost scientific genius of the 16th century. Laying the foundation for modern science, he actively promoted mathematics and astronomy as well as made advances in navigation and optics that helped elevate England to the foremost imperial power in the world. Centuries ahead of his time, his theoretical work included the concept of light speed and prototypes for telescopes and solar panels. Dee, the original “007” (his crown-given moniker), even invented the idea of a “British Empire,” envisioning fledgling America as the new Atlantis, himself as Merlin, and Elizabeth as Arthur. But, as Jason Louv explains, Dee was suppressed from mainstream history because he spent the second half of his career developing a method for contacting angels. 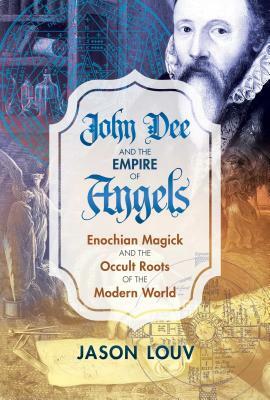 After a brilliant ascent from star student at Cambridge to scientific advisor to the Queen, Dee, with the help of a disreputable, criminal psychic named Edward Kelley, devoted ten years to communing with the angels and archangels of God. These spirit communications gave him the keys to Enochian, the language that mankind spoke before the fall from Eden. Piecing together Dee’s fragmentary Spirit Diaries and scrying sessions, the author examines Enochian in precise detail and explains how the angels used Dee and Kelley as agents to establish a New World Order that they hoped would unify all monotheistic religions and eventually dominate the entire globe. Jason Louv is the author of seven books, including Generation Hex, Ultraculture, and Thee Psychick Bible. He runs the high-traffic site Ultraculture.org and teaches courses on magick and spirituality at Magick.me. He has written for many popular websites, including Boing Boing, VICE News, Motherboard, and Esquire Online. He lives in Los Angeles. "Written in breezy, informal prose, Louv’s overstuffed book will appeal to those interested in angels or the occult."